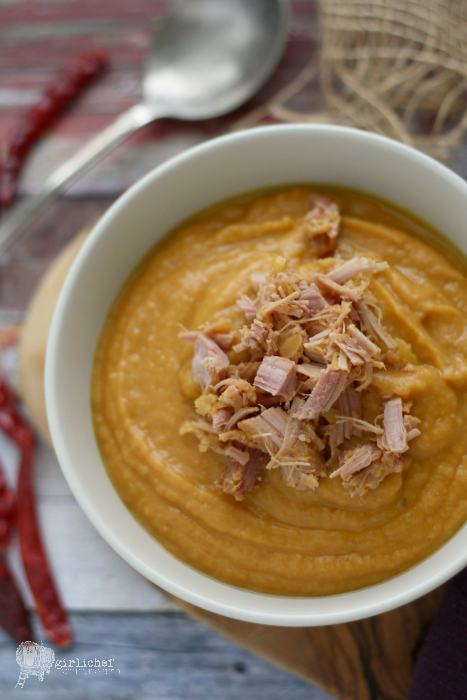 If you know me and my "soup preferences", you're probably surprised to see this recipe. I'm not a very big (or even small) fan of thick, pureed vegetable soups. I usually avoid them like the plague. It feels like I'm eating baby food. And yet, here I am pushing a big pot of baby food in your direction. My only explanation is one I use often—I am a walking contradiction. I haven't gone dark side, this weekend was simply a "clean fridge and pantry" kind of weekend, and well, necessity is the mother of invention. I had a package of yellow split peas that were nearing their best-by date. I still had about a third of a smoked turkey in the fridge. Plus, there's never really a time that celery and carrots aren't waiting their turn in the crisper. Soup it was. Fast forward to the fact that today is actually the start of the 11th week of the Twelve Weeks of Winter Squash—and I've been a true slacker in this department for an entire month. Seriously, I've neglected to post a winter squash recipe for the past four weeks. I'm ashamed. Needless to say, I fell short of that goal this year. But I couldn't let another week go by with only my best intentions to show, so I grabbed a can of pumpkin puree from the pantry and added that to the mix. 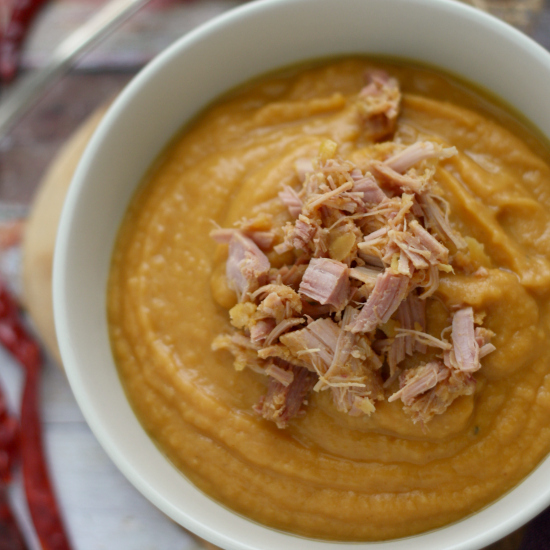 Although there is a cup of pureed pumpkin in this soup, it doesn't taste like pumpkin. It adds color, it adds nutrients, but it's content with a supporting role alongside the other veggies in the cast. This soup is really all about the earthy split peas, all gussied-up in a smoky wardrobe. Add some steaming flatbread hot from the oven, and this made a rib-sticking meal on a frigid afternoon. 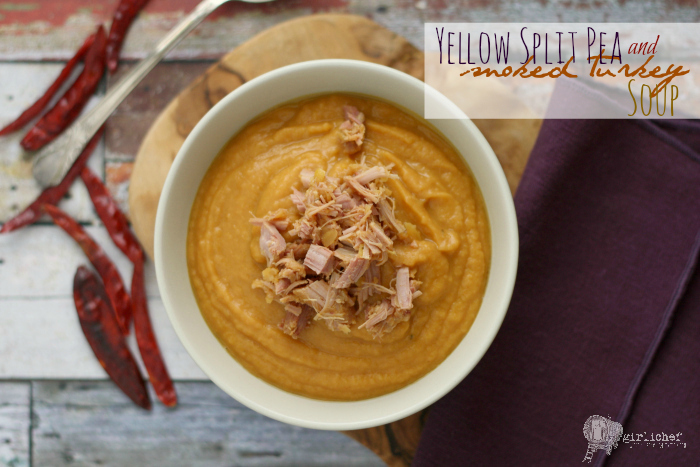 This Split Pea Soup is loaded with veggies and accented by smoky turkey. The perfect way to get your nutrients and warm your bones during the cold winter months. Place all of the ingredients, except salt, in a large Dutch oven or soup pot; add 3 quarts of water. Bring to a boil, reduce heat to a steady simmer for 90 minutes, stirring occasionally. 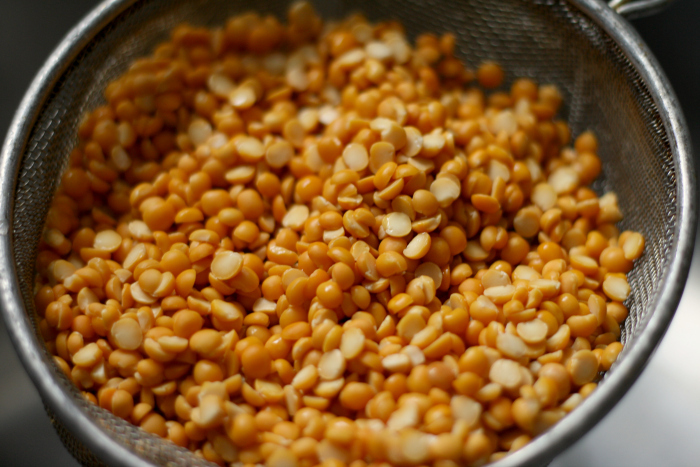 Split peas should be mush and vegetables should be extremely tender. Lift out the turkey and set on a rimmed plate; discard the bay leaf. Once the meat is cool enough to handle, pick as much as you can from the bones, and then chop it up. Use an immersion blender to puree the soup until smooth. Taste and adjust seasoning with salt. It really depends on how salty your smoked turkey was, but you'll need approximately 1 to 1-1/2 teaspoons. Ladle into bowls and serve while very warm, dividing the chopped turkey among the bowls. Follow Heather Schmitt-Gonzalez's board Squash(in') Winter on Pinterest. I am sharing this with Souper Sundays at Kahakai Kitchen.